Nuts! I knew I should have rented a tux! Bummer. I meant to go check out this bar in Old Town called Dirty over the weekend. It’s apparently got a trapeze! I was curious to see if the circus theme carried over to any other aspects of the business plan. Bouncer clowns? Ringmaster DJ? Waitresses bearing drinks on the backs of trained horses? 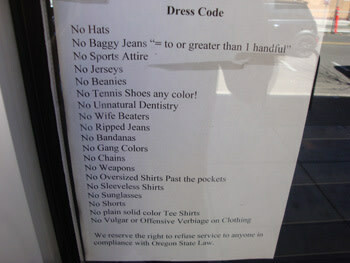 Unfortunately, the sign at the door revealed one of the most draconian dress codes I’ve ever seen! Let’s see, where to begin: I was wearing shorts. I had on tennis shoes. Worst of all, I was flying a solid-color T-shirt! Clearly this upstanding organization does not care for “my sort.” But you know, I’m used to it. As a paunchy, near-sighted Caucasian male, I’ve been battling this kind of discrimination my whole life. Too bad. 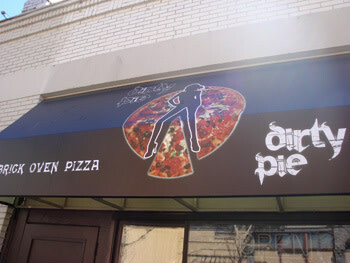 I really wanted to try a slice of Dirty Pie. Yep, it’s obviously too classy a joint for the likes of me. No word on whether the pizza uses locally sourced meat and veggies.